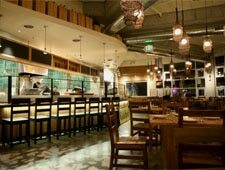 As restaurants evolve so do sensibilities, not least those of Sean Baker, whose green consciousness has raised the culinary level of heirloom produce, seasonal cooking and vegan cuisine to new heights, even for Berkeley, California. At Gather, chef/partner Baker has created a mecca not only for demanding vegetarian gourmands but also for national critics who rave about Baker’s inventive “vegan charcuterie.” The 29-year old chef graduated from Le Cordon Bleu and honed his vegan skills at Millennium Restaurant, followed by cooking at Palo Alto’s Zibibbo, and Gabriella’s Café in Santa Cruz. 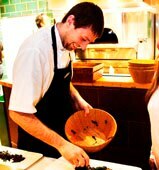 He became the consulting Executive Chef for Bonny Doon Vineyards' Cellar Door before Gather opened last year. Besides practicing his culinary alchemy with seasonal bounty in the kitchen, this young chef also deepens his roots by collaborating with local Bay Area farmers on growing and sourcing heirloom vegetables from around the globe.